Vanna K Blog: She'll say YES to this Unique Diamond Engagement Ring! She'll say YES to this Unique Diamond Engagement Ring! 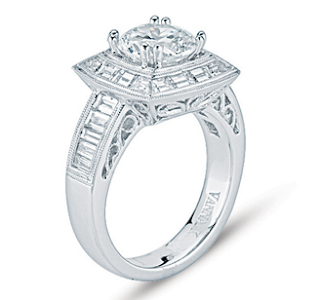 Nothing sparkles more brilliantly than the diamond engagement rings in Vanna K's Cascade Collection. This hand-crafted beauty showcases diamond baguettes at their finest. The 1 Carat round center diamond is surrounded by a full 2 Carats of diamond baguettes. The contrast between the center diamond and the sleek baguettes designed around it is absolutely stunning. It's a bold, brilliant design that she will find completely irresistible.